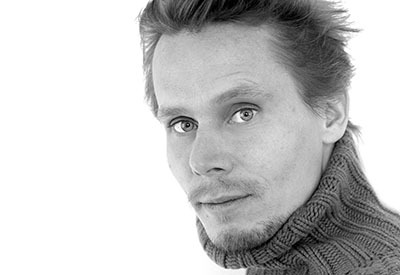 Dancer-choreographer Tero Saarinen began his career as a dancer at the Finnish National Ballet in 1985. Despite his success as a soloist, he left the Finnish National Ballet in 1992 to seek new influences in contemporary dance in Western Europe and Japan, where he studied traditional Japanese dance and Butoh from 1992 to 1993. Saarinen has made more than 40 creations during his career. He founded his own group in 1996 as a canvas for his choreographic work. Apart from his works for Tero Saarinen Company and teaching his movement technique, his handiwork can also be seen in the premieres commissioned by several other prominent dance groups. Nederlands Dans Theater (NDT), the Batsheva Dance Company (Israel), Ballet Gullbenkian (Portugal), the Lyon Opéra Ballet (France), the Gothenburg Opera Ballet (Sweden), Ballet National de Marseille (France), Ballet de Lorraine (France), the Finnish National Ballet, and others have featured Saarinen’s works in their repertoires. As a choreographer Saarinen is known for his unique movement language that plays with balance, and off-balance. Influences ranging from Butoh and martial arts to classical ballet and Western contemporary dance can be seen in his style. His works, which have won wide international acclaim, are characteristically total artworks: combinations of unique choreography, strong performers, striking visuals, and often, live music. Saarinen has received numerous acknowledgements of his work as an artist. In 2001, he was awarded the Finland Prize and, in 2005, the Pro Finlandia medal – the most prestigious recognition given to artists in Finland. Saarinen was awarded the International Movimentos Dance Prize for Best Male Performer in Germany in 2004. In June 2004, he was honoured with the title of Chevalier de l’Ordre des Arts et des Lettres by the Ministry of Culture in France. In 2008, The Finnish Cultural Foundation gave Saarinen an award for his achievements as an artist.